Photos by Stephanie Blentlinger of Lingering Memories Photography. Coach Terry Haas said as time passes, members of Schoolcraft’s 2013 varsity football team will recover from a season-ending, playoff loss and recognize the upside to an otherwise successful season. The Eagles ended their 10-2 season Nov. 16, after bowing out of the playoffs in a 33-7 loss to the Shelby Tigers. Haas said his counterpart said after the game it was the toughest 48 minutes he’s seen his team play all season. Haas said that was evident early on, when the Tigers got on the board quickly and forced Schoolcraft to play catch-up all day. Shelby would go on to lose the following week in a 49-3 shellacking at the hands of the Clinton Redskins. Addressing the 35-man team after the season-ending defeat was tough for Haas, he said. The squad’s roster featured 19 seniors. The three post-season games marked the deepest playoff run Schoolcraft had made since its 14-0, state-championship team of 2001. Haas said the 2013 squad has its own place in history, and that success started right away with a pair of wins over two big-time conference squads. Schoolcraft’s season-opening, 41-14 victory over a tough Parchment team was a good primer for its Week 2 showdown against rival Constantine. Haas said he told his players before the season started that having Parchment and Constantine to open the year – followed by a Week 3 contest against Olivet – would provide a strong measuring stick to see where the Eagles stood three weeks into the season. Constantine would go on to a 5-4 regular season but still have the league’s most productive offense – scoring 366 points. The Eagles’ lone blemish occurred a week later against Olivet, a team that Haas said has always had Schoolcraft’s number. 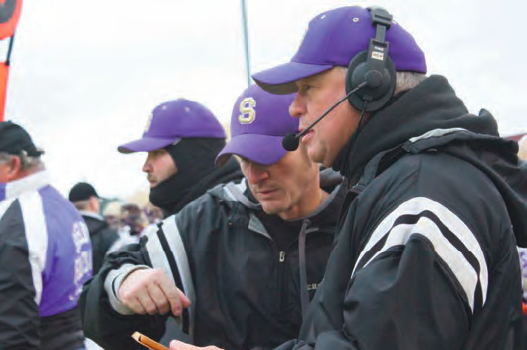 This year was no exception, as Olivet dealt Schoolcraft its only regular-season loss, a 28-14 setback. Olivet and Battle Creek Pennfield would go on to share the league title with Schoolcraft as a trio of one-loss teams. Schoolcraft bounced back after the Olivet loss and won a pair of one-sided affairs against Galesburg-Augusta and Kalamazoo Hackett to up its record to 4-1 going into a huge came against Pennfield. Haas said he knew the league title was on the line and a loss to Pennfield would set Schoolcraft a game behind Olivet and Pennfield for the league crown. At 5-1, the Eagles won the final three regular-season games they were supposed to win against the league’s lower-tier squads before starting its fifth-consecutive year of participating in the playoffs. Schoolcraft won a district title with a pair of nail-biters: 28-21 over Niles Brandywine and 28-26 against Watervliet. Haas, who has 32 years in the books as Schoolcraft’s head coach, said a trademark of his 2013 team was a game-day work ethic. They weren’t unique that practices were never any fun, Haas said, but on game day, he never once had to get his players fired up. The school’s fall sports banquet was November 25, when recipients of the “Coaches’ Choice” team awards were issued. With a 10-team league, Schoolcraft will face the same group of opponents in 2014. He will do so with a roster of young players who gained critical playoff experience this year. The 2013 Schoolcraft Rocket Football program had big successes. The Upper and Lower Purple teams both finished their seasons undefeated, each with a record of 7-0. The Upper and Lower Gold teams also had outstanding seasons with records of 5-2 for the Lower division and 2-5 for the Upper division. Under the direction of Matt and Ashlee Gorham and Zac Marnell, the Flag Football League is also off to great start. “It’s very important for the players to not only have fun but to start off learning the correct fundamentals of the game,” says Matt Gorham. With over 40 players participating in its first season, the future is looking very bright for these soon-to-be Rocket players. Also highlighting this season were the two football tailgates the program hosted. Each team had the chance to play “Under the Lights” for a night game, their last home game of the season. The Upper and Lower Gold Teams hosted a “Golden Tailgate”, October 12. Players and families participated in a pregame meal and festivities before facing Sturgis in front of a packed crowd that night. The Upper and Lower Purple teams hosted a “Pink Tailgate” for their final game against Centreville on October 19. Along with the great food and tailgate games, the Rocket Program was also able to raise over $400 during a halftime fundraiser for the American Cancer Society. “The coaches, players and fans all wore pink during both tailgates to support Breast Cancer research,” says Coach Benny Clark Jr. “It was great to see our community come together and support not only our Rocket Football program but cancer research as well. I am so proud of all of these kids and the Schoolcraft community”. Brenan Vaughn #11, Kyle Santman #21, Charlie Schultz #15 accept the District Title trophy. WATERVLIET – Schoolcraft High School’s varsity football team struggled for most of Friday’s Division 6 district-title game to stop opposing quarterback Luke Traver. *Phil Pelton’s interception and return for a touchdown proved to be the game-winning score for the Eagles. The pick-off came with just under four minutes to play in the game. *Needing a two-point conversion to tie the game at 28-all with less than two minutes to play, Watervliet saw its attempt swatted down by Schoolcraft’s Brennan Vaughn. *The Panthers’ last-gasp effort to score in the final seconds had momentum until Pete Schultz nabbed an interception to secure the Eagles’ tenth win of the season. The interception was forced when linesmen Carter Fowler and Cody Mikel hit Traver as he released the ball, causing the pass to be underthrown. For Schoolcraft, it was a 48-minute roller-coaster ride that extends its season into a twelfth week. The 10-1 Eagles travel to Shelby to take on the Tigers at 1 p.m. Saturday. The fact Schoolcraft remains in the playoffs after Friday’s aerial clinic by Traver is notable, as Watervliet’s quarterback completed 38 of 49 pass attempts for a mind-boggling 460 yards. Traver’s touchdown passes of 23 and 5 yards put the Panthers up, 12-0 early in the second quarter before Schoolcraft answered with two scores of its own to knot the game at 12-12 at halftime. Josh Zemek’s second-quarter runs of 5 and 4 yards accounted for Schoolcraft’s first-half scoring. The second of the two touchdowns came late in the half, when Zemek intercepted a pass and returned the ball to Watervliet’s 16 yard line to set up the tie score. The teams combined for three missed extra-point-kick attempts and one failed two-point conversion in the first 24 minutes. Schoolcraft took its first lead of the game three minutes into the third quarter, when Mikel reached the end zone on a 17-yard run. Zemek’s two-point conversion put the Eagles up, 20-12. Watervliet would tie it at 20 with a score in the fourth quarter. The deadlock would remain until Pelton’s interception and touchdown return on a bobbled pass. Haas said his team’s defense had to adjust to a no-huddle, up-tempo offense employed by Watervliet. Haas said it was an especially memorable night for senior Charlie Schultz, who turned 18 years old Friday. Haas said he also felt good about Vaughn and his role in breaking up Watervliet’s two-point conversion attempt that would have tied the game late in the fourth quarter. The win advances Schoolcraft to its deepest post-season run since the 14-0 state-champion team of 2001. The Eagles, whose only loss this season was to co-league champion Olivet in Week 3, bowed out in the Week 11 district title game last year to Constantine, 40-27. Shelby, meanwhile, is a 10-1 team with its only loss to Spring Lake, 27-0, in the final Friday of the regular season. The school is located in Oceana County, halfway between Ludington and Muskegon. Haas said he and his coaches will spend Sunday looking at game film of Shelby, a squad he admitted he doesn’t know much about. The game against the Tigers was originally scheduled to take place Friday, but Haas said considering the 130-mile distance, he objected to a Friday game and was awarded the matinee game Saturday. Mike Roy, Vicksburg High School’s athletic director (AD), is bothered by parents who think they can yell and scream at the officials and coaches, since they have paid their $5 to get into the contest. He contends that kids hate it when their parents and other adults in the audience act that way. What they really want is support in the form of conversation that goes like this, “I loved to watch you play,” and then on to whatever else is happening that day. If parents think their kid is going to earn a college scholarship through their sport, they should think again, Roy contends. A focus on their studies will yield more and better money in the long run with many academic scholarships going untouched every year, he says. Each year, the helicopter parent seems to get worse, the AD says. He feels that parents should let their kids take risks as it is ok to fail, otherwise, how do they learn to accept failure? If the parent is over protective and overbearing, it hurts the kid and the sport they have chosen. These are key lessons in growing up, Roy believes. A good example of parenting in sports has been Steve Hettinger, who would be what Roy calls a model parent. He is supportive of the coaches and their decisions. He lets his son Chad accept the challenges of playing multiple sports, attends all the games as does Chad’s mother, Gail. Hettinger gives back by donating his time with the youngsters and the high school sports programs, and Chad has picked up that same attitude in his teamwork, Roy says. 1. Cheer everybody on the team, not just your child: Parents should attend as many games as possible and be supportive, yet allow young athletes to find their own solutions. Don’t feel the need to come to their rescue at every crisis. Continue to make positive comments even when the team is struggling. 2. Model appropriate behavior: Contrary to the old saying, children do as you do, not as you say. When a parent projects poise, control and confidence, the young athlete is likely to do the same. And when a parent doesn’t dwell on a tough loss, the young athlete will be enormously appreciative. 3. Know what is suitable to discuss with the coach: The mental and physical treatment of your child is absolutely appropriate. So is seeking advice on ways to help your child improve. And if you are concerned about your child’s behavior in the team setting, bring that up with the coach. Taboo topics: Playing time, team strategy, and discussing team members other than your child. 4. Know your role: Everyone at a game is either a player, a coach, an official or a spectator. “It’s wise to choose only one of those roles at a time,” Brown says. “Some adults have the false impression that by being in a crowd, they become anonymous. People behaving poorly cannot hide.” Here’s a clue: If your child seems embarrassed by you, clean up your act. Thanks to the generosity of several organizations, the Vicksburg High School Stadium received a nearly $8,000 facelift in time for its football season home opener and the Community Tailgate event on September 6. New banners greeted fans on the stadium’s south-side parking lot, as well as a new banner on the north side of the stadium, courtesy of the Athletic Boosters. The Boosters contributed $4,700 to replace the old banners which lasted seven years. The front of the press box now identifies the pride of the Bulldogs with newly-installed signage as a result of the joint effort of the Class of 2013, the Class of 2013 Project Graduation, and from the Athletic Department’s spirit-wear sales, for an additional $2,400. The finishing touch of new goal post pads was through the joint efforts of the Vicksburg Rocket Football program donating $500, and the Athletic Department donating $250, all to add to the District’s pride in its top-of-the-line facilities, according to Athletic Director Mike Roy. SCHOOLCRAFT – Schoolcraft varsity football team’s pursuit of a Kalamazoo Valley Athletic Association title passed a major test and remains intact following a 37-28 win over league nemesis Constantine Sept. 6. The back-and-forth affair was poised to come down to a white-knuckle, “last team to have the ball could be the winner,” ending. But the Eagles’ stifling secondary took advantage of an exhausted Constantine offense in the fourth quarter to secure the win. The victory puts the Eagles at 2-0 and serves revenge on the opponent that dealt Schoolcraft its only loss of the season a year ago: a 40-27 defeat in the second round of the playoffs. Haas said his team and its fans had good reason to engage in what developed into to a raucous, on-field celebration. Prognosticators who forecasted a close game were on target for three quarters. Schoolcraft took a 14-8, first-quarter lead, thanks to a crucial fourth-down conversion during its second possession of the game and a turnover during a later series. After giving up a 97-yard touchdown run to Constantine’s sophomore quarterback Matt Hasbrouck and falling into an 8-0 hole, the Eagles mounted a nine-play, 62-yard drive to cut the deficit to 8-6. The series was highlighted by a 25-yard pass play to Trevor Stoddard and capped by a 6-yard run by senior Charlie Schultz. Senior Brennan Vaughn later helped put the Eagles on top, as he recovered a Constantine fumble and ran 66 yards to the Falcons’ 10-yard line. Two plays later, a pitch to Schultz from four yards out – coupled with a 2-point conversion pass to Stoddard – resulted in the home team’s six-point lead. Schoolcraft broke a 14-14, second-quarter tie on a series of just four plays, covering 67 yards. Senior Cody Mikel created his own highlight reel, with runs of 25 and 31 yards to make it a 21-14 game. A third-quarter possession covered 65 yards in four plays for Schoolcraft, which saw senior quarterback Tom Hurst score on an eight-yard run. Hurst then connected on a pass to Nick Cakmakci for the two-point conversion and a 29-21 margin at the 7:27mark. Schoolcraft would not relinquish its lead, and it put the game out of reach with a short pass play to Vaughn, whose speed turned it into a 47-yard pass play for a touchdown. Senior Blake Zemek’s run for the two points concluded the game’s scoring. The series was set up by a Vaughn fumble recovery on a muffed center-to-quarterback exchange near midfield. Haas conceded going for the two-point conversion on what would be his team’s final score of the night was a gamble. His counterpart, Shawm Griffith, said all things considered, he was surprised to head to the locker room at the half with a lead. The Eagles amassed 219 total yards on the ground, led by Mikel with 83 and Cakmakci with 55. Meanwhile, Vaughn (48), Stoddard (25) and Cakmakci (13) accounted for the all 86 receiving yards in seven attempts by Hurst. Schoolcraft hits the road Friday to Olivet, where the Eagles hope to continue their unbeaten season. Vicksburg High School stadium came to life on a Saturday evening in August with the sights and sounds of football. While summer is winding down, football safety is gearing up. Vicksburg Rocket football announced at its inaugural event that it has aligned itself with USA Football and the organization’s “Heads Up Football” program. Josh Baird, vice-president of Vicksburg’s Rocket Football, states that this USA program, which is funded by the National Football League (NFL), emphasizes safety first for its youngest players. This safety goal will be made easier by the generosity of the United Way and Vicksburg Rotary Club, each donating $750 to Vicksburg Rocket football. Carol Lohman of the United Way and Mike Tichvon of the Rotary Club presented their checks to Kip Young, president of Vicksburg Rocket Football. Young gratefully stated that with these donations, the organization will be able to be equipment-compliant with USA’S Heads Up Football. Hunter Van varsity quarterback shows Cody Roy how to throw. More than 580,000 players and 83,000 coaches nationwide have joined this program, which is also endorsed by organizations including the PAC 10 and Big 10. Through its training and certification, it teaches coaches their Heads Up Tackling method in a step-by-step directive that uses five basic skills to teach and reinforce the mechanics of tackling while reducing helmet contact. This knowledge by the young participants will help the coaches in implementing the new tackle method. Among the different stations that the players participated in on Saturday was a station that demonstrated the USA’s tackle fundamentals.